mommy bytes: What Do Women Want in a Vehicle? What Do Women Want in a Vehicle? Being a gearhead and a mom, I have a long list of requirements for a motor vehicle. Some of them are ridiculous, like it must have a manual transmission, which rules out the entire class of minivans (birth control through avoidance of minivans). Other requirements are mom-related, like it must have at least four doors. Still others are green-related, satisfying my obsessive car spreadsheets and adventures in hypermiling. But my number one requirement is that IT MUST BE SAFE! This is obvious of course, but this recent incident reinforces it. We rented an unnamed minivan for our trip to Washington DC from an unnamed rental company (one company is bankrupt and the other is the largest rental company in the US - may not be who you think). Doug is a car fanatic and he completely checked the car over before we left. It was completely out of washer fluid and down over a quart of oil. The tire pressures were also down a couple of pounds (passable, but we've have worse rentals). We bought two quarts of oil, poured one in and took one for the road. On our way from the Boston area to Washington DC, we stopped in New York to pick up my mother. At that point, we started hearing a noise when the automatic transmission shifted that sounded like "eh". After a few days in the Washington DC area, it was louder, like "Enh!" We started making fun of the van every time it shifted, but didn't think it was necessarily a serious problem. Doug pulled out the user's manual to figure out the type and amount of automatic transmission fluid that the car took. He found that the transmission was a sealed unit and could not be refilled. My mother was concerned about our safety and suggested that we go to the rental company get another minivan. I was more concerned that we squeeze in all our visits on our tight schedule and figured the van would probably make it home fine, it only had 35k miles. By the last day, Doug took one last look under the hood and finally found the automatic transmission fluid refill port. It was marked "Dealer use only". At this point, we didn't want to risk screwing up the car or our rental contract, so we just headed home. Bear in mind, other renters probably wouldn't even think twice about this noise and Doug went far beyond the average renter, adding motor oil and checking everything out. On the way home, the noise continued. We stopped and switched drivers a couple times. I drove through the tricky section past the George Washington bridge onto the Major Deegan highway without incident. I handed the reins over to Doug for the last stretch in Connecticut. While the cruise control was on, the engine suddenly revved and the car didn't accelerate, indicating that the transmission was slipping. Doug took it off the cruise control for the rest of the trip and used the gas pedal manually. It continued to slip a little, but he could control it by accelerating slower. By the time we hit the Mass Pike, the transmission was having serious issues. After the last toll interchange, the van had a hard time accelerating from the FastLane toll speed to highway speed. At this point, we were seven hours into our drive and the kids were tired and the adults were severly afraid that the minivan wouldn't make it home. The stress-o-meter was pegged. The minivan seemed to be fine as long as we didn't have to change speeds, but we were concerned about the last 20 minutes that we had to travel off the highway. At the end of the last ramp, Doug eased the car onto the road. We held our breath at every stop sign and prayed that the van would go. Each time, Doug had to feather the gas pedal lightly hoping the transmission would catch. After five minutes, the transmission started to slip and the engine revved even with the slightest touch of the pedal. We pulled over on the side of the road and let the minivan rest for a minute. Doug eased the car back onto the road again, but it was worse than ever. We came to a stop sign and knew the end was near. Doug eased the gas and gunned the gas. The transmission barely caught on and we got to the other side of the intersection. It was completely kaput as we pulled to the side of the road. We managed to back down into the driveway of a church a few minutes later and we were officially stranded. We had driven 7 hours and 45 minutes and we were 15 minutes from our home. The van's odometer read 35748 miles. I immediately called the rental car company and they helped to set up roadside assistance. We called a neighbor to see if we could be rescued. Thankfully he was home and came to get us and all our stuff. 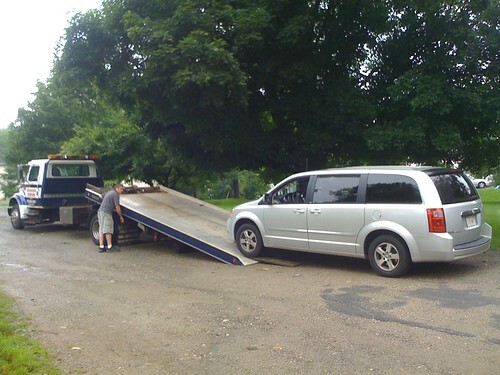 I waited with the minivan after Doug and the kids were picked up and angrily tweeted about our predicament (no holds barred - naming suspects). The tow truck came fairly quickly. The driver was not at all surprised at the failure, as this company has had a long history of automatic transmission problems. Doug and the kids came to pick me up in our trusty Toyota Echo with a MANUAL transmission. All three of our cars have a manual transmissions, and you can be sure that there will be no automatic transmissions or minivans in our future. We were extremely fortunate that we were able to stop in a safe place. I don't even want to think of what would have happened if it failed on the highway. My kids were in this car and having the transmission fail at 35k miles is UNACCEPTABLE. It's been a few weeks since the incident, and whenever my kids see the same type of minivan, they still say "Bad Ol' Minivan!" If you've made it this far into this post, bless you! On Thursday, I will be attending a Ford and BlogHer event ( #FordBlogHer ) and they want to know, "What do you want in a vehicle?" Please let me know in the comments and I will bring them to the event.